Françoise Pfaff, a pioneer of African Cinema Studies in the United States, has a foot in three continents—France, the Americas and Africa. 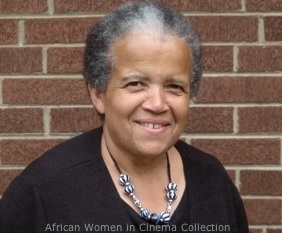 Fourteen years after our conversation in 1997, which was published in Sisters of the Screen: Women of Africa on Film Video and Television (2000) we reconvene to talk about her work since then, as well as return to some of the topics discussed. Françoise, you have multiple identities and ties to three continents! Please talk about how this all began. I was born in France of Guadeloupean and Alsatian parentage. I was destined to cross continents and countries because of my origins. My father, who was from Guadeloupe, enrolled in the military—which enabled him to go up the social ladder—and retired at the rank of lieutenant. This was pretty good for a colonized person, since at the time Guadeloupe was a colony and not a département. My mother, who was born in Alsace, was a beautician and owned a hair salon in Paris. Alsace is at the eastern border of France between France and Germany, so it is interesting how my father came from Guadeloupe, from the west and my mother from east to west and they met in Paris. What was very interesting about my mother’s hair salon was that, though originally it had a white clientele, eventually it catered to black people. Located next to a dance hall called Madinina, several black people came to the shop and asked my mother to do their hair. Since she was already familiar with the hot iron and knew how to wave and curl, they showed her how to use it on their hair. Little by little this clientele grew and her white clientele diminished. Not necessarily for racial reasons. She had a hair salon that catered to men and women and the barbershop had a mixture of black and white men. Because she did not have state-of-the-art equipment to do permanents and other styles in fashion she specialized in black hair and enjoyed it. She had many friends among her clientele and spoke highly of them. I don’t think that she had any prejudice. She came from the province, she was not from Paris. I am talking about the hair salon because there were important people who frequented it. My mother often talked about Stellio who blew in his clarinet. I learned later he was one of the bassist of Martinican and Guadeloupean music in Paris, who created his own style. And in her belongings, I found a picture of Stellio that he dedicate to her. She also had as a client, Madame Eboué, the wife of Félix Eboué, as well as Susanne Césaire, the first wife of Aimé Césaire, and who was herself a writer and journalist. Still another client was the daughter of the Eboué’s who would become the first wife of Leopold Senghor. She spoke highly of the Nardal sisters—one a musician and the other a journalist—referring to them with a lot of respect. And I say that because to my mother, who was white, the idea of race was not important. This was crucial in my upbringing. I knew that if I were black and different, I was as intelligent as everybody else. It was not an impediment. Because her customers were also part of the black intelligentsia and were successful. When I came to the shop as a child I would see all these people from the Caribbean and West Africa which I think had an influence on me in seeking my roots later on—visiting Guadeloupe and writing a book about Maryse Condé and then seeking knowledge about Africa via film. Though I did not know it at the time, my mother exposed me to a multi-cultural, multi-lingual environment and showed me the respect for black culture and the pride in being black. So I think her background is very important for me to talk about. You studied literature and cinema at Université de Paris VII, what were some of the highlights. Well I wanted to be a doctor but did not do well in chemistry. I also thought that I was destined to be a hairdresser so I went to beauty school and got certified but did not like it. Back at the university I attended film classes with critic Michel Ciment who used American cinema to explore American society. That was very exciting to me, perhaps even more than exploring it through literature, though I did that too. And this had an influence on what I would do later at Howard University, teach Africa through film, in the same way that he taught America through film. What was the focus of your doctoral dissertation? My dissertation was on the portrayal of Black Americans in film, especially during the “blaxploitation” era. And every time I got a chance I would do research on Black culture. I remember writing about Joseph Conrad’s Heart of Darkness, and other topics regarding Africa and African American culture. So your experiences with “le regard croisé”(cross-cultural perspectives) in relationship to African-American culture started early? Well among the black intelligentsia who went to my mother’s beauty shop was [the Black American painter] Lois Mailou Jones. They met before the Second World War when Lois was studying at l’Academie de la Grande Chaumière in Paris through a scholarship. While in a taxi she asked the driver, while showing him her hair, if he knew of a place where she could get her hair done. He told her he knew just the place. As my mother was known as the hairdresser who did black people’s hair in the 30’s in Paris, he took her there. And that was the beginning of a long friendship between my mother and Lois Mailou Jones. And during the war of course she did not return. She came back when she was able to and visited my mother. They remained friends until Lois’s death. What brought you to the United States to teach? I first came to the United States to teach French at Bates College in Maine as a teaching assistant for a year. Afterwards, Lois, who was a professor at Howard University at the time looked into a possibility for me to teach there. The next year I was hired as a sabbatical replacement in the French Department. I enjoyed the experience, amazed to see an institution [HBCU-Historically Black College and University] run by black people because I never saw that before. I went back to France and taught on the high school level and realized this was not what I wanted to do. Then I applied both in Africa and at Howard University. I was accepted to work in Côte d’Ivoire but got cold feet, and since I was also accepted back at Howard I went there to teach, and the rest in history as here I am in the United States some thirty years later, where I feel that I have more freedom in my teaching. We can return again to my mother’s beauty shop where I met Lois, which brought me to Howard University. How did you develop an interest in African cinema? It happened when I met Ousmane Sembene at Howard University around 1976 where he was invited to speak. I saw his film Black Girl which was screened on campus, and that was my first exposure to African film. I was very impressed and wanted to know more, to see more of his films. I received a grant to do research in Senegal where I interviewed Sembene, resulting in my first book, The Cinema of Ousmane Sembene: A Pioneer of African Cinema, published in 1984. Afterwards, people coined me as the specialist of Sembene. Then I researched other filmmakers, which gave birth to my second book, Twenty-five Black African Filmmakers. That was the beginning the virus of my interest in African cinema and I incorporated this new knowledge in my teaching. My colleagues were rather skeptical, not aware of the power of film as a pedagogical tool to teach culture, literature, politics, economics, etc. In 1978, I started my first classes in African cinema, at the graduate level in French, and at the undergraduate level in English, having decided that I would teach the class in English to get a larger audience. And in all modesty the classes are full, to the extent that a second person was hired to teach among other courses, a second section of the class. People are very visual these days, they are into video, the Internet and they appreciate the course. African Americans strangely enough, are rather limited in their knowledge of Africa and they discover all sorts of things through the course. And very humbly speaking, I think that my main contribution at Howard University has been teaching African culture through film. And I think that has been something very important in terms of my relationship to Africa. You are a pioneer in African Cinema Studies in the United States. It is true I wrote the first book about an African filmmaker in English. I have talked at many conferences and film forums in the United States and get many request to speak and to do articles on African cinema. I suppose I am a daughter of the oral tradition, people say that I know how to lecture, I don’t know if that is true, but I have done a lot of that, in addition to teaching a lot of French. I define myself as someone versed in African Studies and African Film Studies. How would you compare African Cinema Studies in the United States, Africa and Europe. France has a tremendous library of African cinema and has been at the forefront of African cinema for a very long time. They systematically keep a copy of the films that they have helped finance. There is also a very good collection of books on African film there. Though I don’t believe African film studies is incorporated in university studies in France as it is in the United States, where a lot of French Departments incorporate Francophone films in their programs. Africa is the “parent pauvre” (poor parent) in this regard and when I went to do research recently in Senegal, I was amazed to see how little the African youth know about African cinema. You are familiar with the problems of distribution of African films. Well these young people grew up on Indian, American and French films but not African films. Perhaps they have seen Mandabi, Xala, a few films by Sembene, but they don’t know African cinema as a whole. And it was interesting when I interviewed young African filmmakers, the new generation, how they deplored that lack of an African cinema culture. So they have to create their own base and feel that if they knew more about what their predecessors had done, that it would help them produce new styles and perhaps save them some time. I visited the school, IESS-Institut supérieur de l'image et du son/studio école in Ouagadougou when I was at FESPACO  and I see that there is an effort to establish film schools. And now President Wade in Senegal is trying to establish a pan-African Cinema Center in the outskirts of Dakar. Obviously Africa is still very poor in African film studies. Now of course there is the South African film library initiative, which I hope will help African film studies in Africa. And among Francophone and Anglophone regions? Some people make a dichotomy between Francophone and Anglophone African cinema. I don’t think the dichotomy is as rigid as some people want to believe. People say that Francophone cinema is more art cinema and Anglophone cinema is more commercial, with of course, Nollywood. People say that the Nigerians have found the key to successful commercial film within Nollywood. Well if I look at the history of Francophone African cinema I can see people like Momar Thiam, Tidiane Aw, with their films Le bracelet de bronze, or Bacs, those were very successful films, they were really exploring a commercial vein of action film. Well, for me to say that Nollywood has invented those action films, those commercially viable films is not quite true. I would compare them now today to films made for DVD produced in Ghana, Nigeria, Kenya and Tanzania. What is a bit annoying is they use the same recipe over and over and over again. Nollywood film themes are based on money, the supernatural, basically some femme fatale, which causes the destruction of the male protagonist. It is a kind of assembly line. They found a formula and repeat it ad vitam aeternam and maybe out of this repetition one day you will have here and there a good film. Maybe it is making money for the producers but I don’t think it is making a tremendous contribution to African cinema. Maybe one day when there is more sophistication in the production, in the storytelling, in the scriptwriting, you will end up with a good film. You may say that I am biased but I thing that Francophone films up to now are of better quality. You have written or edited several books on African cinema, what have been your experiences? The first book on Sembene, at the time it was extremely difficult to find a publisher because no one had heard about African cinema [in the United States]. I think now looking back, it is the one that I am the proudest of because it was groundbreaking. And people consider it as a classic in African Cinema Studies. During my research, Sembene gave me a lot of his time. Sometimes he challenged my questions. Not only did I ask questions, but he asked me questions as well. And you had better be prepared! He was kind of unforgiving when he found that you had not done your preparation. But when he realized that you were serious, then he responded adequately to your request for an interview. For Twenty-five Black African Filmmakers I decided to pick the 25 filmmakers that I liked and the films that I liked. I know that it is a very biased way to select movies to make a book but that is what I did. I tried to have various people throughout the continent in order to be representative. Though the bulk were Francophone, there were representatives from East and South Africa and Anglophone regions. It was commissioned by the same publisher as my first book, Greenwood Press. The next book, Focus on African Films (2004), I asked colleagues to contribute to the collection. You were one of them with your article on Safi Faye. I thought it would be a breeze, though perhaps it was more difficult than those that I wrote myself. So I decided for future works I would do it on my own (laughter). I am using it as a textbook for my African Cinema class. And while it is again heavily Francophone, I tried to give a bird’s eye view of African cinema. Since I did not know about all of the regions in Africa, I also asked colleagues who were knowledgeable about different regions to contribute. The last book, L’ecoute du cinema senegalais/In Tune with African Cinema (2010) emerged from my research as a Fulbright Scholar in Senegal. You notice Aicha Thiam, a woman, on the cover of the book. Recently there has been the coming of more women in Senegal, where as before there was only Safi Faye. There is a new wave of women in African cinema that will bring their own contribution, their own topics, their own worldview, in an otherwise all male field. I think my books have provided an archive. They will remain and continue to be read after I am gone. So that is my contribution to the exposure of African culture through the study of African film. I have always felt that the image of Africa has been betrayed by western cinema and this is what has pushed me to do this work.